The Mootekkis, an east-meets-west Tokyo-based 5-piece rock’n’roll band, were formed midway through 2008 and were featured on the front cover of Japanzine after winning the magazine’s nation-wide battle of the bands. 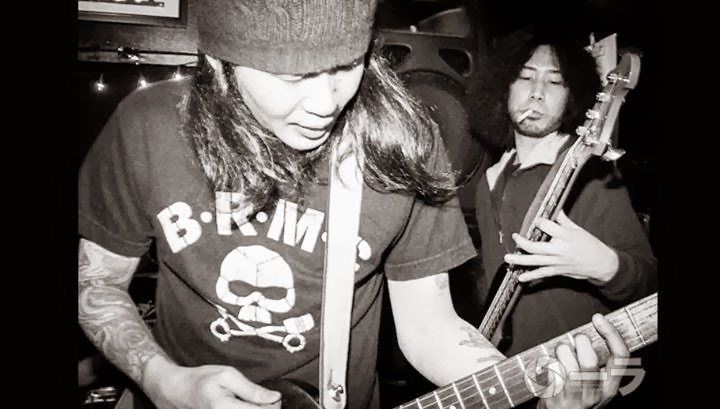 They went on to get airplay on InterFM 76.1 one of Tokyo’s biggest radio stations and due to their no-holds-barred, beer-fuelled rock’n’roll they have also been targeted by local drum’n’bass DJ’s for remixes. In August 2012 they embarked on a 10 day tour of New York where they played Manhattan hot spots Bowery Electric and Piano’s as well as New Haven’s Elm Bar and a handful of basement and loft parties in Brooklyn. Earlier in the year they took the stage at Metropolis Magazine’s “Saiko” event alongside internationally traveled Japanese bands – Tokyo Pinsalocks and Moja – and there’s no sign of them slowing down. What’s next for these five brothers from different mothers? What isn’t next? Jungles!! from Red Bacteria Vacuum is an all-girl Japanese punk band from Osaka formed in 1998 currently consisting of IKUM!, 325, Yagoromaru and Jasmine. The band relocated to Tokyo in 2000. Their first EP Roller Coaster was released in January 2006. They have gone through numerous member changes, notably with the major problem of filling in for the departing Akeming, their original drummer who left the band when pregnant with her first child. Katsu was later found to be the new drummer, but left early 2009. By April of 2009, Jasmine became the their permanent drummer, appearing in their new album and touring with them for Japan Girls Nite. Most recently Yagoroumaru has joined on as the band’s bassist. The band has also re-presented themselves as ‘Jungles!! !’ changing their name from the former ‘Red Bacteria Vaccum’ in response to the new member line-up. The band performed in the US numerous times throughout the years, usually as part of BENTEN Label’s Japan Nite, an annual tour promoting Japanese indie bands in America. As part of their 2009 American tour, they played at the opening of New People, a building dedicated to Japanese culture in San Francisco. The group released their album, “Dolly Dolly, Make an Epoch” in October 2009. The band toured in the US once again in March 2010, appearing at SXSW as well as participating in the Japan Nite tour once again. Now as Jungles!!! they return to Japan Nite 2014. After trying out various projects, Kitcha realized his true ambition. Sharing his visions with Petri, together they decided to form a visual project from scratch. That marked the start of Crestillion, a newly founded band residing in Sweden. With a melodic yet happy sound, mixed with eastern visual influences, this band brings something truly unique to audiences around the world. mothercoat is a lowpop style band hailing from Fukaya-City Saitama, Japan. They have developed a cult following across the UK, America and Canada where they have toured extensively and played several showcase gigs including SXSW and Rockness festival.They are quirky, innovative and exhilarating. You undoubtedly should go see them. From 2012 mothercoat sets its base in Fukaya-City with their private studio and vegetable field to devote themselves to music even more.